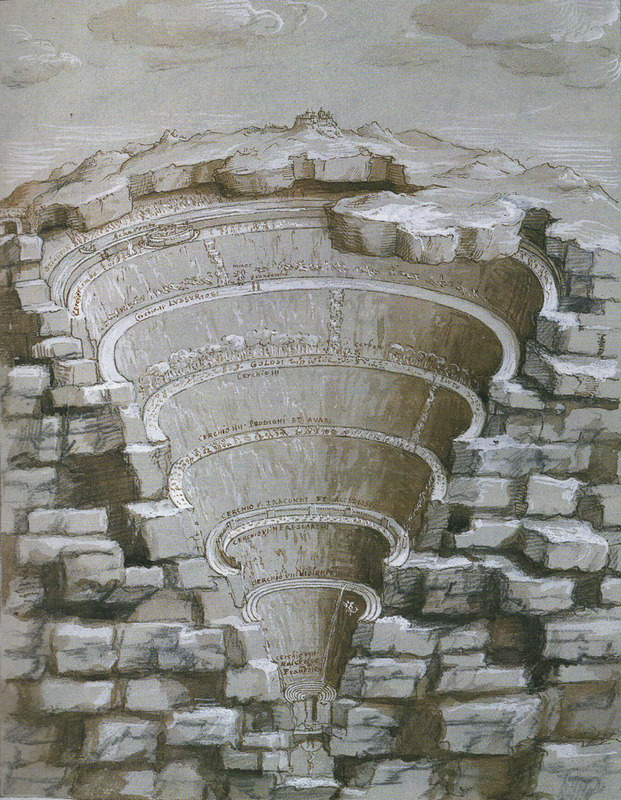 Those of you familiar with Dante’s circles of hell will realize there is not a tenth level. Dante stopped with Level 9 or Cocytus, the place in hell where Satan resides, forever gnashing between his teeth the three traitors: Judas, Brutus and Cassius. Oh, and it’s where all betrayers of God, family, country and benefactors spend eternity. Forever frozen deep in the ice, faces showing, eyes and mouth frozen shut. Kind of like how the die-hard fans of tonight’s MNF game will find themselves as they brave the below zero wind chill, the swirling snow, frozen pipes, and iced bleachers of the University of Minnesota stadium. It will be more than the Bears vs Vikings. It will be man vs elements. Man vs nature. And we all know how that usually ends. Very poorly for man. But even this is not the tenth level of hell. No. The tenth level is reserved for me. It is my own private hell. One I’ve mentioned repeatedly. It is the final level. The one beyond the lustful, the gluttonous, the hoarders and spendthrifts, the heretics, the fraudulent, the violent and the traitors. This is the level reserved for me and Favre-haters. This is the level reserved for those who have spent the past 20+ years despising the quarterback who won’t go away. Yes, that’s a picture of the mama’s boy in a Bears uniform. 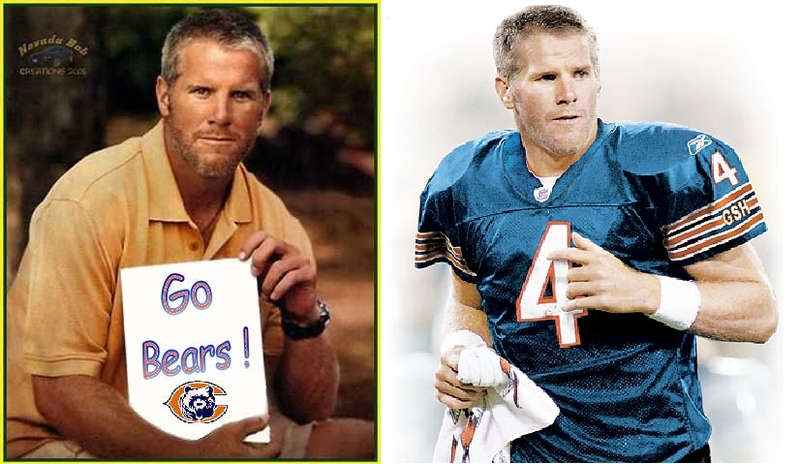 The very hint of Favre becoming a Bear has given me nightmare material for years. And those who are aware of this fear, continue to harass me with such grotesque images (thanks, Jared). As a matter of fact, Favre has given many of my friends and relatives ample harrassment material for years. One such friend gave me an 8×10 picture of my nemesis the week after Favre announced his first retirement, complete with a personalized note…”I’ll miss you, Love Brett” (thanks, Tony). And my own mother gave me the Brett Favre figurine ornament released by Hallmark. I was collecting the series but refused to buy the Favre ornament. No way. She didn’t want me to break up the collection, or that’s what she said. I know it was payback for my defiant high school days. Needless to say, the ornament has never seen the branch of my sports tree. Or the light of day, for that matter. But, trust me when I say I don’t want to spend an eternity in the tenth level. I’ve tried to garner some respect for the quarterback, for his career stats, his talent on the field, and I even dug deep within during the MNF game against the Raiders, just one day after his father died…but I just can’t do it. I can’t stop the hate. Is it the blue and orange that runs deep in my veins? Could it be his forever unshaven-scruffy face? Or maybe it’s the fact he incorrectly pronounces his own name (someone please explain how one gets “Farv” out of Favre). Whatever it is, I can’t rid myself of it. 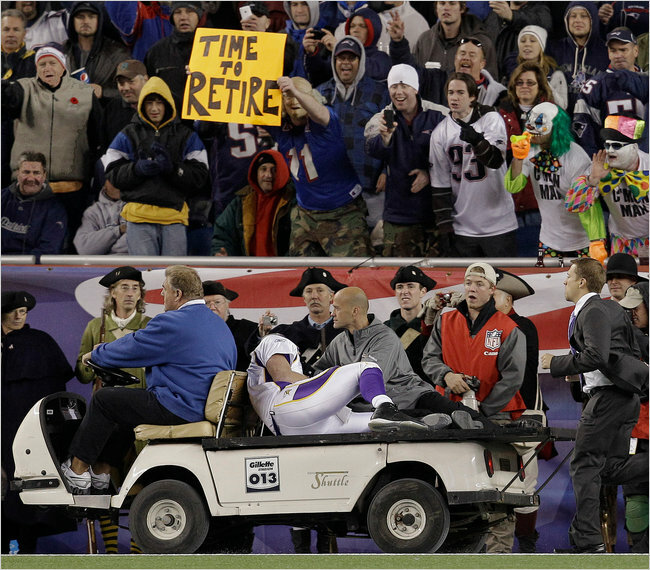 Which is the true reason why I wish he would just retire. It’s more than the fact I’m sick of hearing about his supposed retirement from the NFL, or if he’ll play, or if he did send lascivious texts to a woman who was not his wife. It’s the fact I consider myself a kind and compassionate person, one who sympathizes with others and longs to help those in need. A woman who offers everyone the benefit of the doubt, who doesn’t judge. That is, unless you are a quarterback named Brett Favre. Then all bets are off.